$8.00 in a variety of colors, everyday! Click on this link to view web page! 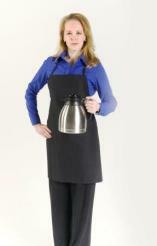 Online discount manufacturer of chef pants starting at $11.50 and chef coats starting at $10.00. Custom hemmed to your inseam request.� Additional�processing time required for hemming chef pants. 7.5 oz 65% polyester, 35% combed cotton twill. stand up collar, in long sleeves with french cuffs. We also offer 3/4 length sleeves or short sleeves for an additional cost. Prices begin at $10.00 for long sleeve and start at $12.00 for short sleeve or three-quarter sleeve. 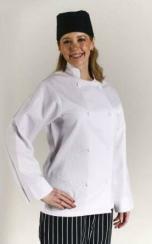 Please allow additional processing time required for short sleeve and 3/4 sleeve length chef coats. 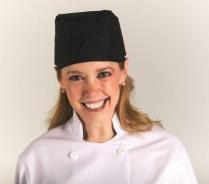 in a domestic made chef coat. black/white or colors for as little as $.50 ea. on white coats only! MINIMUM ORDER REQUIRED. Click on picture for details and sizing. 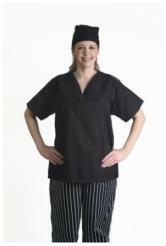 Black or white scrub top, 65/35 poly-cotton poplin. Left breast pocket, short sleeves, V neck front. 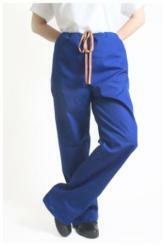 Black or white 4.5 oz poly-cotton poplin scrub pant, drawstring waist, one rear pocket. Black or white poly-cotton 4.5 oz poplin cap, tie back. black or white twill measures 28" x 28". NO pockets. Neck tie. Adjustable waist ties. 7.5 oz twill, adjustable waist ties. Still a big seller, shepherd's check. Unlike claims from competitors, cotton or poly/cotton is more comfortable than spun polyester which is only good for stain resistance and laundries used for table cloth and napkins (Have you tried to wipe your hands with a spun poly napkin lately, it is the least absorbent product. If you care about cool comfort, believe us, spun poly is not the answer). Use your imagination or your existing company/restaurant logo with or without your name below. Sublimation gas transfer is not like silkscreening, you cannot feel the ink or print, it is embedded into the polyester yarn to insure a lifetime sharp image, it will not peel, crack or bleed even with bleach. There are no limits to colors or shades, the max size is 8x10. Need something to do on your free time? Turn that computer on with your favorite drawing software and create your own logo. Make sure the file you send us has the high resolution, min 800 kb. Have fun!